The Sino-Vietnam relations soured following the reunification of Vietnam after the Vietnam War though China assisted North Vietnam during the Vietnam War. since the end of the Vietnam War in 1975. The bilateral relations between the two nations have been turbulent despite their common socialist background. Centuries of conquest by the PRC’s imperial predecessor have given Vietnam an entrenched suspicion of Chinese attempts to dominate it. Although the two nations are part of Asia, enmity and friendship often occur from time to time until now. Both nations made diplomatic relations after the long conflicts of struggling for interests of economics, politics, annexation etc. The Sino-Vietnam relations started from the prior history, moved to World War II, Cold War, Sino-Vietnamese War, Post-Cold War and bilateral relations until now. The history of bilateral relations between these nations periodically started from the Prior History Era until their relations nowadays. The interactions between the two nations have been happening since prior history that the Chinese Warring States Period and Vietnamese Thuc Dinasty of the 3rd century BC as noted in the Vietnamese historical record Đại Việt sử ký toàn thư. Vietnam’s military conquests often brought it into diplomatic conflict with China. After Vietnam destroyed Champa in the 1471 invasion, it attempted the conquest of Malacca. He proceeded to Malacca instead, and its ruler sent back tribute to China. Malacca again sent envoys to China in 1481 to inform the Chinese that, while Malaccan envoys were returning to Malacca from China in 1469, the Vietnamese attacked the Malaccans, killing some of them while castrating the young and enslaving them. The Chinese Emperor sent a letter to the Vietnamese ruler reproaching him for the incident, and also ordered the Malaccans to raise soldiers to defend themselves against the Vietnamese in the event of another invasion. The Tientsin Treaty recognized French dominance over Vietnam and Indochina, spelling the end of formal Chinese influence on Vietnam, and the beginning of Vietnam’s French colonial period. During the World War II, both China and Vietnam faced invasion and occupation by imperial Japan while languished under the rule of the pro-Nazi Vichy French. The great powers of states in the world fought each other in the name of politics and tried to influence the others with their military powers and destruction everywhere with very large number of casualties. The Nazi powers and their influences invaded many countries among the European states and over some regions of Asia. France maintained the dominance of control over its colonies until World War II, when Japanese war in the Pacific triggered the invasion of Indochina. Vietnam’s natural resources are exploited for the benefit of the Japanese military campaigns into Burma, the Malay Peninsula and India. In the last years of the war, nationalist insurgency emerged under the troops of Ho Chi Minh, to independence and communism. Following the defeat of Japan, nationalist forces against the French colonial forced in the First War of Indochina started in 1945 to 1954. France suffered a major defeat at the Battle of Dien Bien Phu and in a short time after it was pulled from Vietnam. Countries that fought in the Vietnam War divided Vietnam at 17th parallel into North Vietnam and South Vietnam in accordance Geneva Agreement (Geneva Accords). In the Cold War era, two greatest powers were divided as communist and non-communist. The communist government of North Vietnam was rejected by the United States (U.S.) for its resemblance to the Soviet Union and the People’s Republic of China (PRC). Disagreements soon arose over the idea of elections and reunification (North and South Vietnam), and the U.S. began to increase the contribution of military advisers, even the Soviet troops and weapons supplies to strengthen the communist military. Controversial attack on U.S. ships sparked the American military strikes against North Vietnam military installation and placement of more than 500,000 troops in South Vietnam. The Vietnam War soon began after the North Vietnam had been supported by both communist states USSR and China. The Vietnam War was part of the Cold War. Two warring camps were the Republic of Vietnam (South Vietnam) and the Democratic Republic of Vietnam (North Vietnam). United States, South Korea, Thailand, Australia, New Zealand and the Philippines allied with South Vietnam, while the USSR and China supported North Vietnam which is a communist state. This war resulted in massive exodus of Vietnamese citizens to other countries, especially the United States, Australia and other Western countries, so that in these countries can be found a fairly large Vietnamese community. After the end of this war, both are also united Vietnam in 1976. One of the most famous victims of the Vietnam War was Kim Phuc. The support of China to North Vietnam in the Vietnam War was one of their relations. The other form of the relations will be found in so many forms as Vietnam joined ASEAN in 1995. Vietnam’s membership in ASEAN which was achieved in 1995 is widely regarded as a powerful symbol and most significant result of Hanoi’s new foreign policy as part of the dai moi renovation process. In 1995 Vietnam scored a triple diplomatic success by joining ASEAN, establishing official relations with the United States and signing a ground-breaking framework cooperation agreement with the European Union. The political actors have very successfully and actively worked to build and strengthen as many international cooperation ties as possible. China and Vietnam have made so many relations even wars are part of them. Ever since the Vietnamese nation-state emerged as an independent entity in the first millennium it has had to contend with ‘the tyranny of geography’. Vietnam shares a common border with China its giant neighbor to the north. Even today with a population of eighty-eight million. Vietnam ranks as a middle sized Chinese province. PRC was the first state to recognize the communist Vietnam in January 1950. In the late 1970s bilateral relations turned acrimonious over a number of issues – border security, Vietnam’s treatment of ethnic Chinese, Hanoi’s alignment with Moscow, and the Kampuecha problem. The relations turned hostile when Vietnam invaded Cambodia in late 1978 and China retaliated by attacking Vietnam’s northern border in early 1979. Vietnam and China remained in a state of hostilities for a decade. By the mid to late 1980s both sides recognized that the military situation in Cambodia had reached a stalemate and the conflict could only be ended through political negotiations. In September 1989 Vietnam unilaterally withdrew its military forces from Cambodia. This set the stage for both parties to initiate the process of normalization of their relations at a secret summit of party leaders in Chengdu in southern China in September 1990. Formal normalization did not occur until November 1991, pointedly only after Vietnam had agreed to China’s demand for a comprehensive political settlement in Cambodia. Both sides then exchanged high-level party and state delegations. Major agreement and expectations for the future were set out in joint communiqués issued in 1992, 1994, and 1995 following these discussions. Contentious border issues were assigned to specialist groups for negotiation. Military-to-military contact was resumed. Vietnam and China return in seeking harmonious bilateral relations these days. The momentum was a meeting between the Secretary General of the Communist Party Phu Trong in Hanoi with Chinese Ambassador to Vietnam Kong Xuanyou. On that occasion, as reported by Xinhua, Xuanyou began its work in Vietnam. 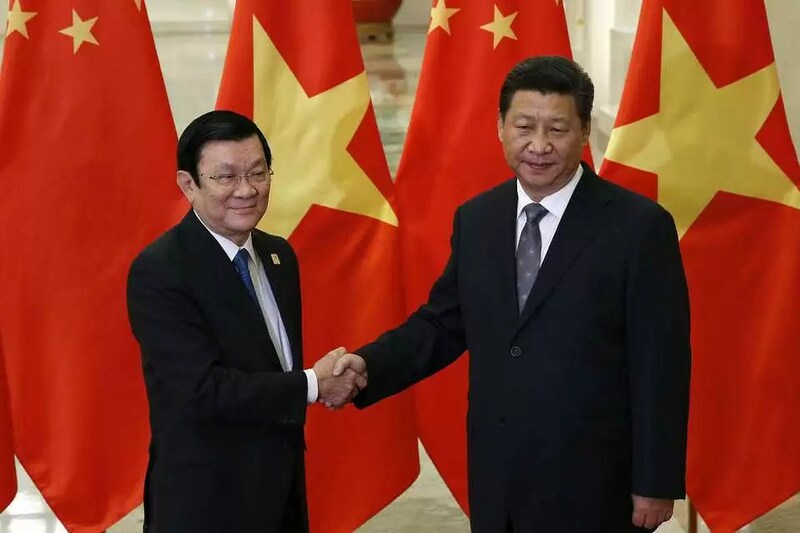 In that meeting, Trong said that Vietnam consistently emphasized the importance of improving the traditional friendships and comprehensive treaties with China. The two agreed that their conflicts (the South China Sea conflict etc) will be resolved. In June 2011, Vietnam announced that its military would conduct new exercises in the South China Sea. China had previously voiced its disagreement over Vietnamese oil exploration in the area, stating that the Spratly Islands and the surrounding waters were its sovereign territory. Defense of the South China Sea was cited as one of the possible missions of the refurbished Chinese aircraft carrier, formerly the Soviet vessel Varyag, which began sea trials in 2011. In October 2011, Nguyen Phu Trong, the General Secretary of the Communist Party of Vietnam, made an official visit to China at the invitation of General Secretary of the Communist Party of China Hu Jintao, with the aim of improving bilateral relations in the wake of the border disputes. Womack, Brantly. 2006. China and Vietnam: The Politics of Asymmetry. New York: Cambridge University Press. Dosch, Jorn. 2006. Vietnam’s ASEAN Membership Revisited: Golden Opportunity or Golden Cage?. Institute of Southeast Asian Studies. Thayer, Carlyle A. 2010. Vietnam And Rising China: The Structural Dynamics of Mature Asymmetry. Southeast Asian Affairs. Whoa, wonderful weblog page layout! The length of time do you think you're writing a blog to get? you made posting glimpse uncomplicated. The overall peek of this website is great, let alone the material!